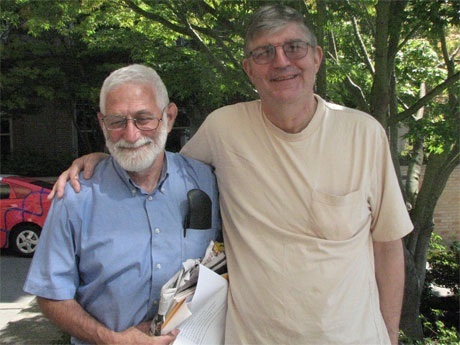 Lee Perlman’s death is a personal loss as well as a blow to Eliot. I have known Lee as a friend and activist for around three decades, primarily through our mutual advocacy for Eliot’s preservation both as a residential community and historic asset and as a reminder of the legacy of Portland’s origins and the role of its black and immigrant communities. I joke that Lee’s commitment to historic Eliot was so extreme that his house retained the original paint and probably shingles. Although home maintenance was not a high priority for Lee, he was always willing to volunteer his time helping his neighbors and unreserved in his contributions to the Eliot Neighborhood. My initial meeting with Lee was at the old Renewable Urban Neighborhood Technology (RUNT) house. I learned about RUNT from an early Whole Earth Catalogue (a reference likely to be lost on younger readers). RUNT was a fledgling effort at both “urban pioneering” and what is now called sustainability, especially with respect to use of energy and water. At that time, “urban pioneers” were individuals, primarily white, who were willing to move into impoverished, crime ridden areas to invest time and money in their rehabilitation. Urban pioneering was as much focused on community organizing as housing rehabilitation. That may be a useful distinction between it and “gentrification,” which is typically a more selfish activity. Lee came by his role as a community organizer and neighborhood activist as an extension of his family’s enterprise. I was unaware of this part of Lee’s background until the past few years when I revealed some of my own background as a leftist activist. It turns out Lee’s family includes lawyers who represented many noted activists in their travails with government and corporate opponents of social justice and civil society. Lee’s activism was rooted in his role as a journalist, rather than a lawyer. In my view, and I think Lee’s, he resembled I.F. Stone more than current journalists who like to make news stories about themselves. Like Stone, Lee was a voracious reader and news gatherer, which allowed him to do in-depth research for his articles. His preferred topic was the struggle for the soul of Portland’s poorer neighborhoods against non-resident developers and City policy makers. As a journalist, Lee had the luxury to attend the numerous City meetings where planning and development is discussed and neighborhood meetings where development proposals are pitched. That gave him invaluable insights into trends that he was then able to translate into warnings for Eliot and other “at risk” neighborhoods. Through him, Eliot was much better prepared to anticipate proposals and policies that would devalue Eliot’s character and/or the role the Association could play to steer City policies and non-resident developer plans. His contributions to the Albina Community and Eliot Neighborhood Plans and the Emanuel Institution Management Plans was critical to at least slowing efforts in the 1970s and 1980s to raze Eliot housing for further expansion of the Emanuel campus and to accommodate warehouses to support the Convention Center. Lee was relentless in reminding City policy makers as well as development interests that Eliot has been much abused by their prior ill-fated plans and development efforts. It was a rare public meeting in which Lee did not draw a link between City sanctioned displacement of poor and minority residents and businesses for a legacy of vacant blocks and underused public facilities in Eliot, a legacy that is responsible for the impoverishment of Portland’s black community to this day. Sadly, Lee was well aware constant vigilance was necessary to restrain the tides of politics and commerce that continue to batter his beloved Eliot. He was a reliable bulwark that will be sorely missed as that battle continues. I will have Lee’s memory in my heart as I soldier on with this battle and am confident others will, as well. You can remember Lee at the Lee Perlman Memorial on September 15th.